The British Chamber of Commerce recently joined the Business Regulatory Review Agency (BRRA) in hosting a multi-stakeholder event in Lusaka earlier this week. The event was designed to, other things, provide a snapshot of BRRA as an entity, its main achievements and challenges since inception as well as a regulatory impact assessment report and short-to-medium term focus covering the next three (3) years. In 2008, Government appointed a Business Licensing Reform Committee (BLRC) whose mandate was to steer implementation of comprehensive business licensing reforms. The BLRC report highlighted that Zambia had a weak regulatory and policy formulation system with limited or no consultation with stakeholders. This resulted in policy and regulatory frameworks that had adverse impacts on private sector development. The report further highlighted that failure to harness and effectively use Information and Communication Technology (ICTs) to streamline licensing processes and develop integrated systems resulted in cumbersome, bureaucratic, inefficient and costly business registration processes. Business reforms aimed at improving the business environment. One such reform was the enactment of the Business Regulatory Act no. 3 of 2014 as a vehicle for providing a legal framework to govern business regulation and implement recommendations by the BLRC. The BRRA was established as a Statutory Body under Ministry of Commerce, Trade and Industry (MCTI) by the Business Regulatory Act. Coordinate development and implementation of appropriate regulatory interventions in order to improve the delivery of regulatory services and reduce the regulatory burden on businesses. Monitoring and evaluating the business regulatory environment. Section 6 of the Act provides as follows. A public body shall only submit to Cabinet for approval a policy or proposed law to regulate business activity if that policy or proposed law has the prior approval of the Business Regulatory Agency. (a) Give notice in in writing to the Agency, of the intention to introduce or review a regulatory framework or policy regulating business activity, at least two months before submitting it to Cabinet. Received 11 notifications which are currently at different stages. A Regulatory Services Centre (RSC) is a One Stop Unit established to facilitate one-stop compliance with multiple regulatory requirements by multiple Regulatory Agencies under one roof in order to provide for an efficient and effective business regulatory clearance system. The RSCs are aimed at streamlining business registration procedures and reducing the time it takes to comply with business regulations by offering the services of various Regulatory Agencies under one roof. The RSCs also serve to increase accessibility of business regulatory services as well as facilitate promotion of investment. The BR Act No. 3 of 2014 provides for establishing and operationalizing an RSC at least in each Province. Four (04) RSCs have been established and operationalised so far. These are located in Lusaka, Livingstone, Kitwe and Chipata. Assessments for suitable accommodation for RSCs were conducted in Solwezi, Kasama, Mansa and Chinsali. Office accommodation for RSCs was identified in Solwezi and Kasama. The two RSCs have been targeted for establishment and operationalisation by December 2018. BRRA is coordinating the implementation of the One Stop Shop Integration System (OSSIS). The OSSIS is meant to compliment RSCs by facilitating sharing of information on business regulatory requirements among Regulatory Agencies. OSSIS leverages e-platform in business regulation and facilitates sharing of regulatory requirements from another Regulatory Agency which has already collected those requirements. The OSSIS was successfully piloted from 2016 to 2017 with Patents and Companies Registration Agency (PACRA), Zambia Revenue Authority (ZRA) and National Pensions Scheme Authority (NAPSA). Phase I of OSSIS implemented. I.e. Integration of systems for PACRA, ZRA, NAPSA, WCFCB, FIC and ZPPA. Now it takes on average twenty-four (24) hours to comply with PACRA, ZRA and NAPSA from the Regulatory Services Centres. Phase III to be implemented by December 2018 i.e. integration of all other relevant regulatory agencies and Local Authorities. Establishment, maintenance and upgrade of eRegistry by BRRA is provided for under Section 8 of the Business Regulatory Act No.3 of 2014.
information on licenses and regulations including formalities businesses have to comply with, and capable of facilitating the processing of applications online. Informational e-Registry – has been implemented. Transactional e-Registry – development being supported by the World Bank. World Bank also supporting development of Noticeand-Comment Platform which will facilitate submission of comments online on proposed regulations affecting business. Contacts of issuing Regulatory Agencies. The Business Regulatory Act No.3 of 2014 under Section 10 stipulates that there should be established for businesses in each sector or group of businesses in a sector, a Single Licensing System. Single Licensing System means a licensing system designed to facilitate compliance with multiple licensing requirements by multiple regulatory bodies through a single regulatory point or a Regulatory Services Centre (RSC). In other words, it is an integrated approach to processing and issuing all required licenses and permits for businesses operating in a given sector or sub sector. BRRA analysed regulatory frameworks obtaining in the Tourism Sector and established that businesses needed to comply with a minimum of twelve regulatory agencies to obtain a Tourism Enterprise Licence. The agency proceeded to engage Regulatory Agencies to identify gaps and duplications and it came to light that gaps and duplications do exist and Government intervention is needed. BRRA as a coordinating Agency for Single Licensing Systems for various sectors has developed a roadmap for development and operationalisation of the Single Licensing System for the Tourism Sector. Resistance by some regulatory agencies to mainstreaming of RIA in policy and legislation formulation processes. Development of Single licensing Systems for various sectors. 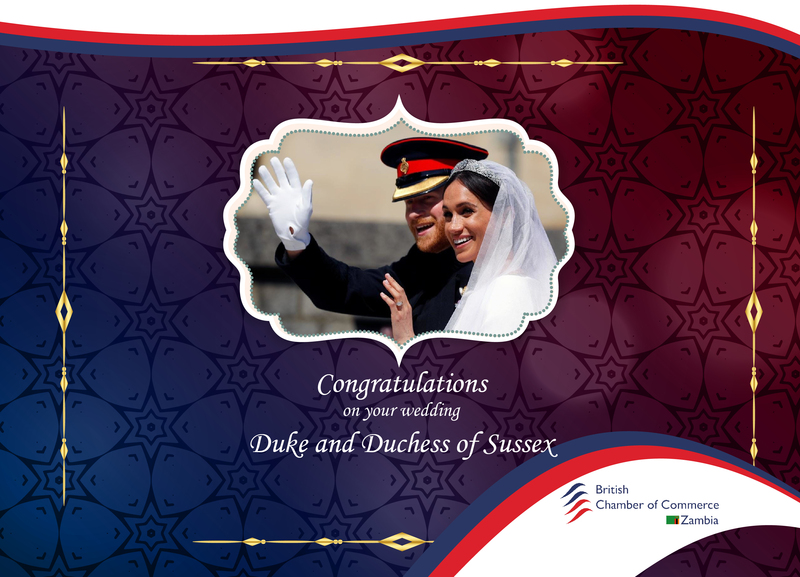 The British Chamber of Commerce in Zambia would like to congratulate the Duke and Duchess of Sussex on their royal wedding on May 19, 2018. 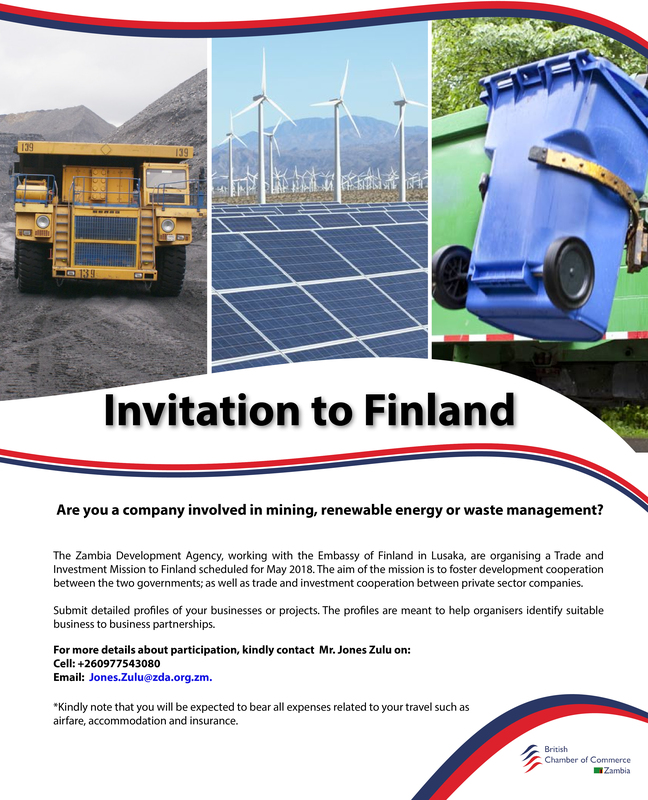 The Zambia Development Agency, and Embassy of Finland in Lusaka, are organising a Trade and Investment Mission to Finland scheduled for May 2018. The aim of the mission is to foster development cooperation between the two governments; as well as trade and investment cooperation between private sector companies in economic sectors such as mining, renewable energy and waste management. The mission is a follow up to the inward bound investment mission from Finland that we hosted in September 2017. The mission is particularly designed to facilitate joint ventures and identify match making opportunities with Finish companies. In view of this, we wish to invite you to attend this mission to Finland. If interested, you will be expected to submit detailed profiles of your businesses or projects. The profiles are meant to help organisers identify suitable business to business partnerships. *Kindly note that you will be expected to bear all expenses related to your travel such as airfare, accommodation and insurance. For more details about participation, kindly contact Mr. Jones Zulu on +260977543080 or jones.zulu@zda.org.zm.